Until now, the most likely culprit for this microwave emission was thought to be a class of organic molecules known as polycyclic aromatic hydrocarbons (PAHs) – carbon-based molecules found throughout interstellar space and recognized by the distinct, yet faint infrared (IR) light they emit. Nanodiamonds -- particularly hydrogenated nanodiamonds, those bristling with hydrogen-bearing molecules on their surfaces -- also naturally emit in the infrared portion of the spectrum, but at a different wavelength. 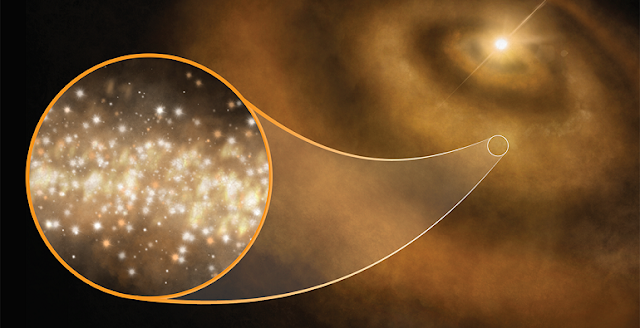 A series of observations with the National Science Foundation’s Green Bank Telescope (GBT) in West Virginia and the Australia Telescope Compact Array (ATCA) has -- for the first time -- homed in on three clear sources of AME light, the protoplanetary disks surrounding the young stars known as V892 Tau, HD 97048, and MWC 297. The GBT observed V892 Tau and the ATCA observed the other two systems. In astronomy, nanodiamonds are special in that their structure produces what is known as a “dipole moment” – an arrangement of atoms that allows them to emit electromagnetic radiation when they spin. Because these particles are so small – smaller than normal dust particles in a protoplanetary disk -- they are able to spin exceptionally fast, emitting radiation in the microwave range rather than in the meter-wavelength range, where galactic and intergalactic radiation would probably drown it out. Wow, it's really beautiful. I see it seriously.